Chang admits to being influenced by the Default Recipe — i.e., the Toll House recipe — and I suspect most Americans who have been baking for any length of time both have that recipe memorized and also have their own variations. Chang’s recipe deviates from the standard in a number of ways: she mixes in chopped milk chocolate in addition to the dark chocolate chunks, she swaps out some of the all-purpose flour for bread flour, and she bakes the cookies longer (18 minutes) and at a lower temperature (350°F). Like many modern bakers, she recommends resting the cookie batter in the refrigerator overnight. She doesn’t specify the actual chocolate she uses, but in the bakery the cookies are clearly labeled as using TCHO, a California-based company which makes many different chocolate blends (including, as I understand it, custom flavor profiles for large wholesale customers). This is how the Flour cookies came out when I tried to make them. They are about a third too large. In a food processor, pulse together brown and granulated sugars to break up clumps and mix thoroughly. In a large bowl, sift together the flours, salt, and baking soda. Stir in chocolate chips. In a small bowl, beat eggs and vanilla together using a fork. Using a stand mixer with paddle beater, cream together butter and mixed sugars on medium speed for 3–5 minutes, stopping half way to scrape down the bowl and beater. Add egg mixture and beat for another minute or until smooth, then scrape down bowl again. With mixer on low speed, slowly add flour-chocolate mixture and stir until combined, scraping down bowl one more time. Fold in nuts, if using. Transfer to an air-tight container and refrigerate overnight. Preheat oven to 375°F (190°C). Set oven rack in middle position. Scoop out balls of dough using a #20 disher onto a parchment-lined baking sheet, 5 inches apart on center. (Nine cookies fit on a standard standard baking sheet; eight on a standard half-sheet pan.) Cover the sheet with plastic wrap or waxed paper and flatten the balls with the palm of your hand. Bake for 10–12 minutes, until the edges of the cookies just start to turn golden. Let rest in the pan, on a cooling rack, for another 5 minutes, then remove to a separate cooling rack until completely cool. 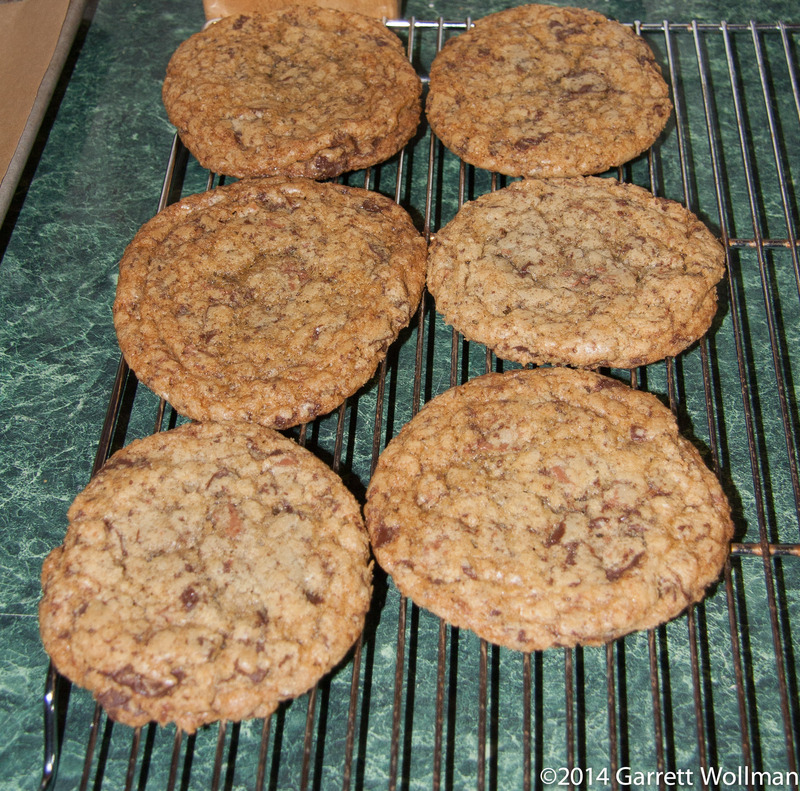 The chopped walnut pieces are clearly visible in these cookies, which isn’t always the case. This cookie, shown bottom-side-up in my cookie jar, was made without walnuts, and was also slightly underbaked. It’s not uncommon for the chocolate chips to end up denser at the center than at the edges, resulting in a liquid chocolate center that is difficult to lift with a spatula, thus the hole. Note that my cookies are actually quite flat, and do not have the layered structure that the Flour cookies do; I’m not sure what the reason for that is: it could be chips versus chunks, whole-wheat flour vs. bread flour, or even differences in the leavening. It might even be due to the fact that I let the dough warm up a bit before baking, or that I used the traditional time and temperature rather than Chang’s lower, slower procedure. Lots of things to play with here; it would be fair to say that my cookies never come out exactly the same, since I’m constantly fiddling with the procedure or the ingredients. In any event, I actually really like the layers in the bakery version, but on the other hand, I also like the deeper color and extra molasses-y punch of the dark brown sugar in my recipe. 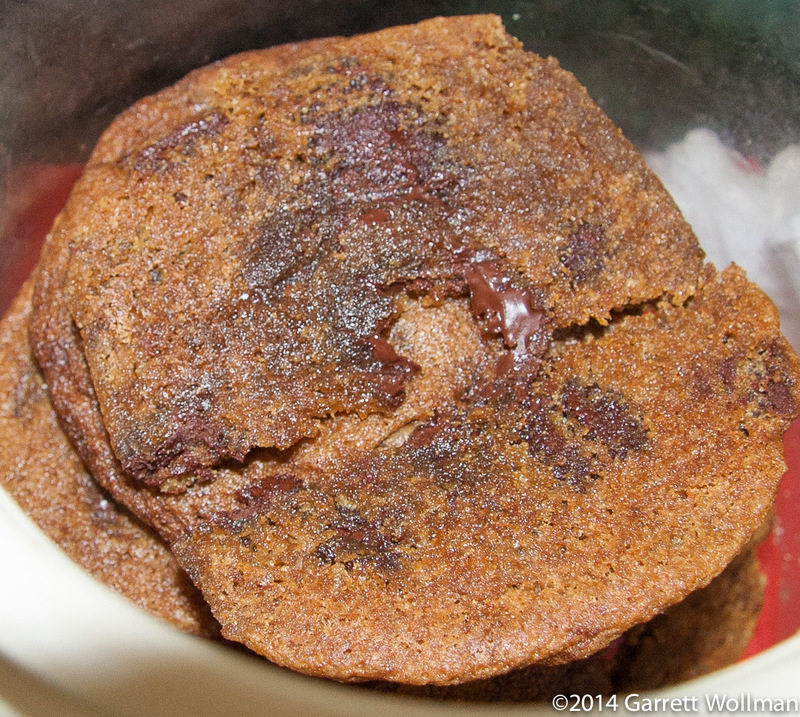 This entry was posted in Food and tagged chocolate chip cookies, Joanne Chang, recipe. Bookmark the permalink.